Nice one duc. I told you to set off early as the place goes mental. I was told when i went that most there don't speak spanish. The speak Valentican and would rather you spoke to them in English than spanish lol. Glad you had a great time, you sure got to see an historical race. I'll add some photos and stuff when I've just got a load of important but neglected things caught up with. My wife took about 63 million photos but at first glance I would say only half a dozen are any good. 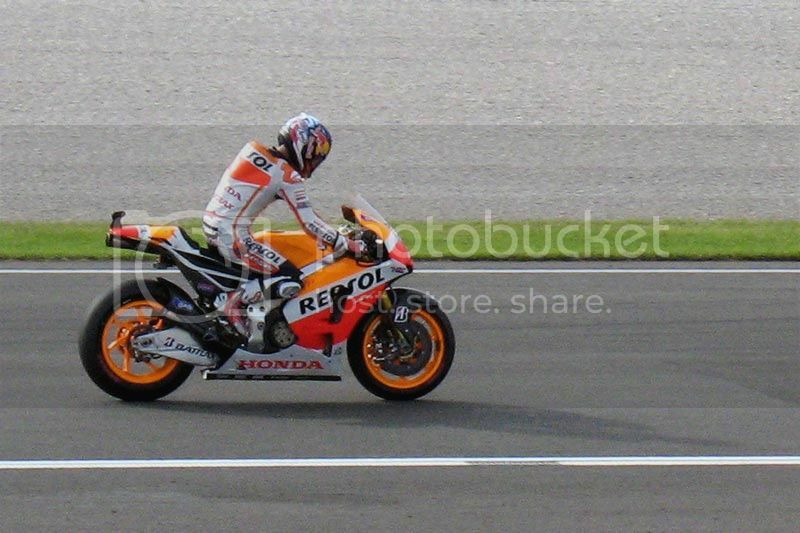 I see loads of photos with just empty track as the bikes were going so fast that she missed them altogether. Where do you guys host photos for sharing with a URL? Nice to meet Duc btw. Thnx Chris, can't wait to see your photos. Perhaps lil red can help with your request, he seems to know about posting photos via link and stuff. Glad you had a good time, and met the elusive Duc, we missed him at Guna. I opened a photobucket account, sorted my pics into folders and posted a link to the relevant folder so peeps got the full album to view. I'll post some pics as well. Currently traveling in Europe so haven't had a chance. And please no worries on storage space. The server has more than enough room since I moved us to a dedicated server a few months ago. And now that we are in the offseason, I plan on working through some updates to the site and server. I get back to the US next week. 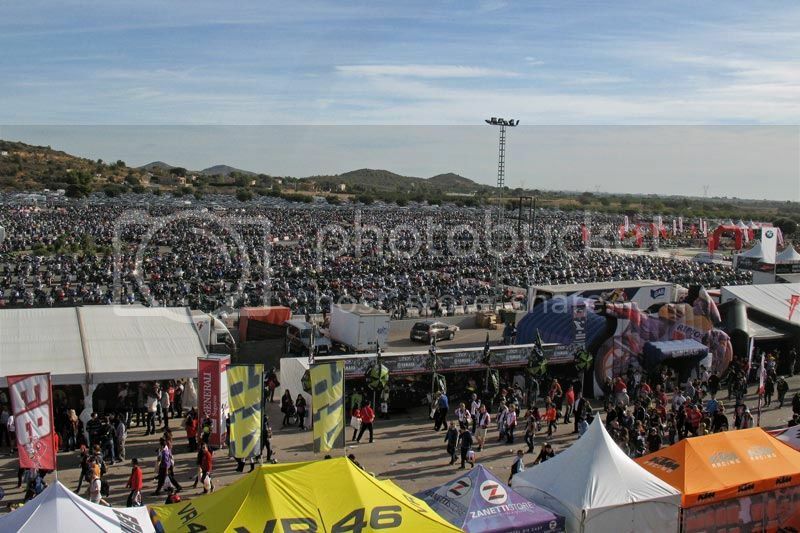 I like to see not just photo's of the bikes and track, but also pics of the venue, people ect. Gives a real flavour of the experience. 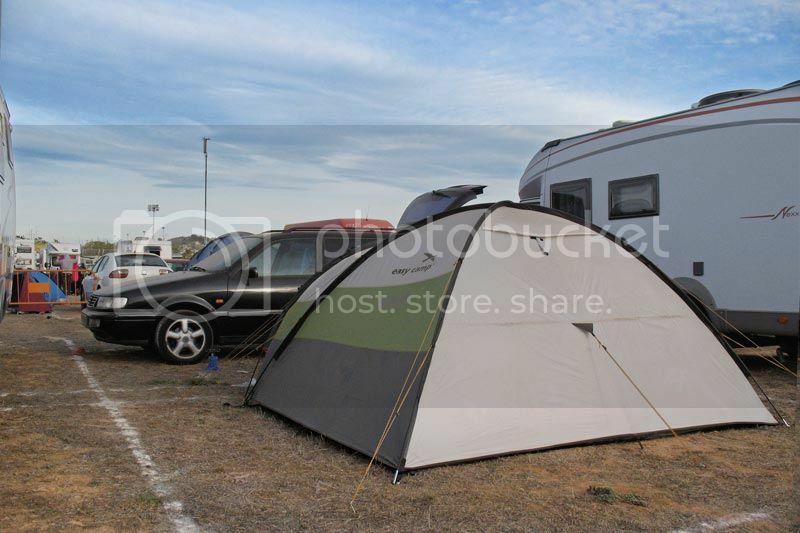 Having arrived on Friday morning with our new tent and just about everything else you could imagine just chucked in the back of our estate car, we found the camping ground and set about the supposedly easy task of putting the tent up. 'Easy Camp' says the tent. No such luck! The ground was full of rocks or concrete, bent pegs barely a couple of inches in the ground, Spanish borrowing my mallet and hammer every couple of minutes. I just about gave up after approximately two hours. Off to Cheste by train in the evening and came back with twenty 100mm screws and washers. Tent now well and truly fastened to the ground in an almost semi permanent fashion. I'll just remember to pack a battery drill next time out. Pre town centre lunacy we went to the track to discover our seats and take in a bit of the practice sessions. 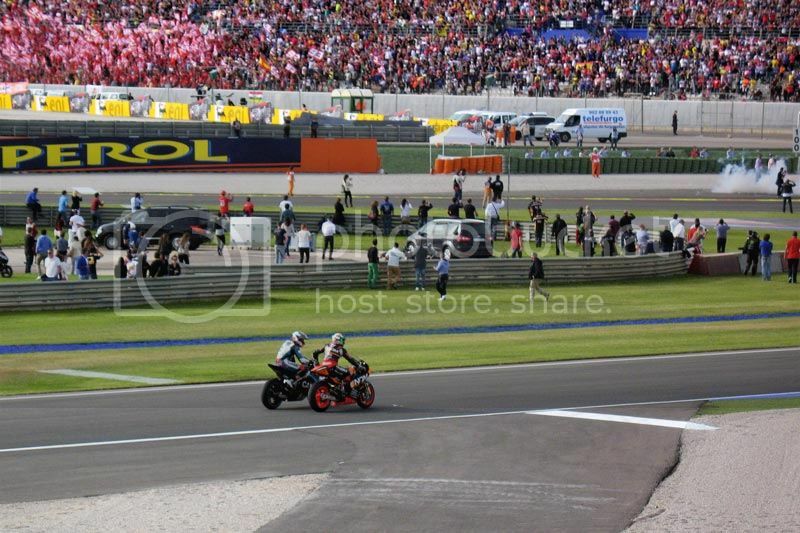 The track and stands were fairly quiet but there was a sense that something big was about to happen in the coming days. Duc turned up and introduced himself. The afternoon was pleasant but slightly breezy and the seats were in a good spot with most of the track visible (the point of the OP). After the bikes finished we headed to the local train for the one stop ride into Cheste. The train was reasonably busy but nothing compared to the complete chaos we were to be faced with the following evening. Cheste town centre was completely mad and filled with nutters who's idea of fun was all about chucking their baffles in the nearest skip and hitting the ignition rev limiter for as long as the surrounding crowd applauded. There were people and bikes everywhere, deafening music, nice ladies dancing on outside bars without much for the imagination to be concerned about. 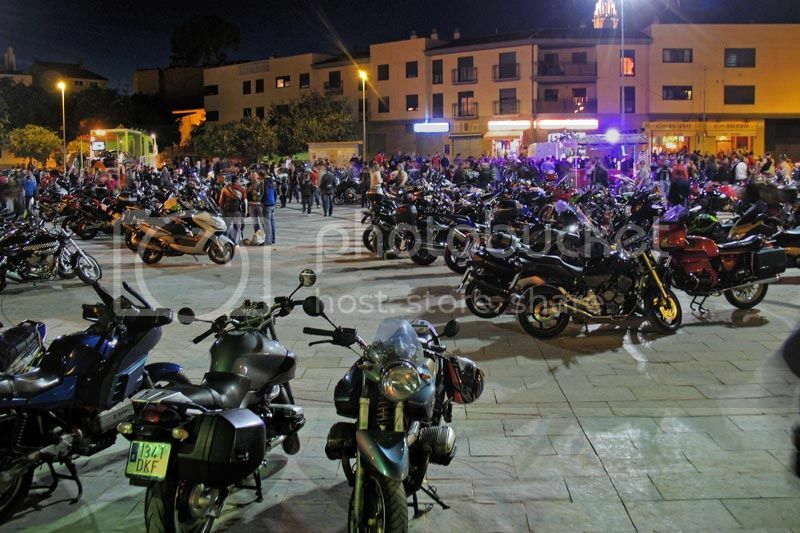 The whole place was one big party and the surprise to me was that the locals were not only on board with all this but in fact the MotoGP has become a major event on the town's cultural calendar. Saturday qualifying was all pretty standard stuff and the results were unsurprising. The place was now filling up and the atmosphere was building. 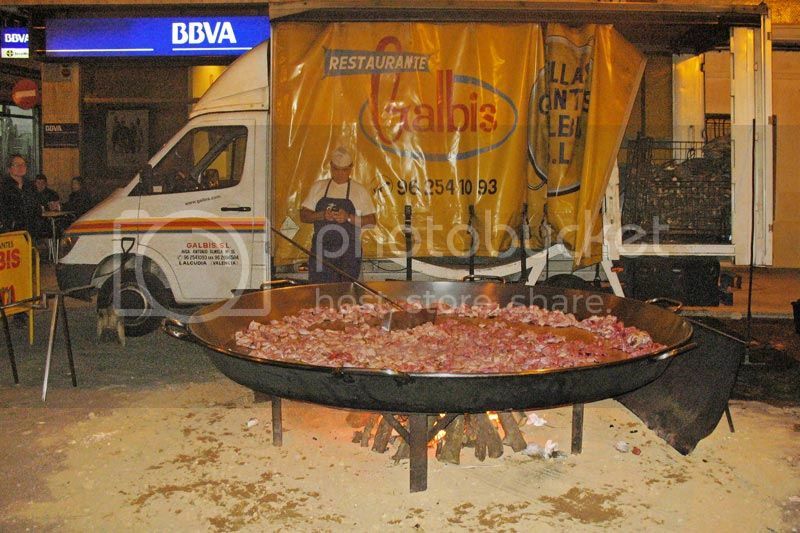 Everything about Saturday night in Cheste town was OTT. The train was probably the most ridiculous piece of organisation known to man. Hundreds of people going in two completely opposite directions (Valencia & Cheste) were herded onto one slightly bouncy platform to await their fate. When the Cheste bound train eventually turned up we were literally pushed into the train by the shear force of people behind. How nobody fell through the gap is a complete mystery! The train just about got moving with about fifty tonnes of human cargo and then similar scenes of chaos at Cheste when the same amount of people tried to get off the train and out of the station through a couple of ticket barriers which eventually broke down. 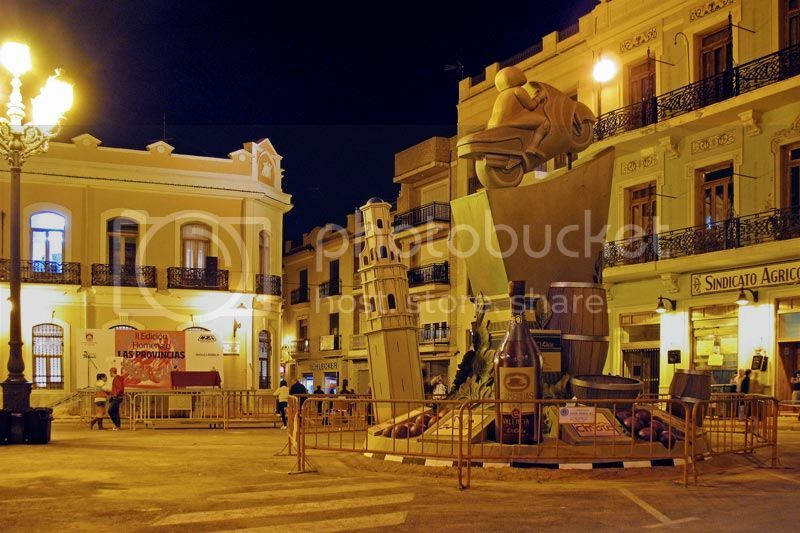 The town centre was many times more mad than the previous evening. I'm not sure how to describe this to someone who hasn't been in the situation. You fill a space to bursting point with humans, in this case a large network of local streets. The people can hardly move in any direction because of each other. Then, just for good measure, you force a dozen 1000cc bikes though the crowd while testing the functionality of their rev limiters. It was fun for about the first fifteen minutes but somewhere in the last forty five years I must have become old and the relative sanctuary of a typically crappy Chinese restaurant seemed like a very good alternative. This shot was outside of the war zone. Sunday!!! As a veteran of UK events such as the HA 'Bulldog Bash' and various prestigious drag racing rounds at Santa Pod, I thought I was prepared. In reality I can't begin to describe the overall sense of awesomeness. This event was truly huge! 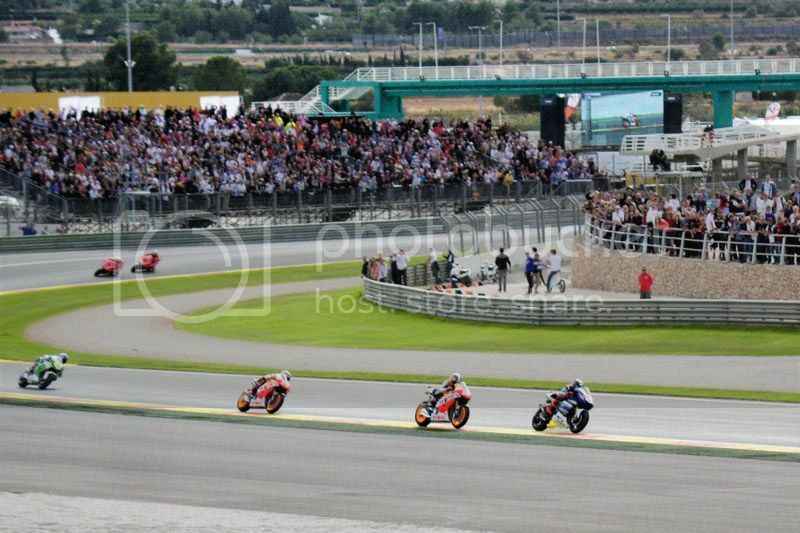 The atmosphere was electric, everything was full to bursting and the enthusiasm was unimaginable. 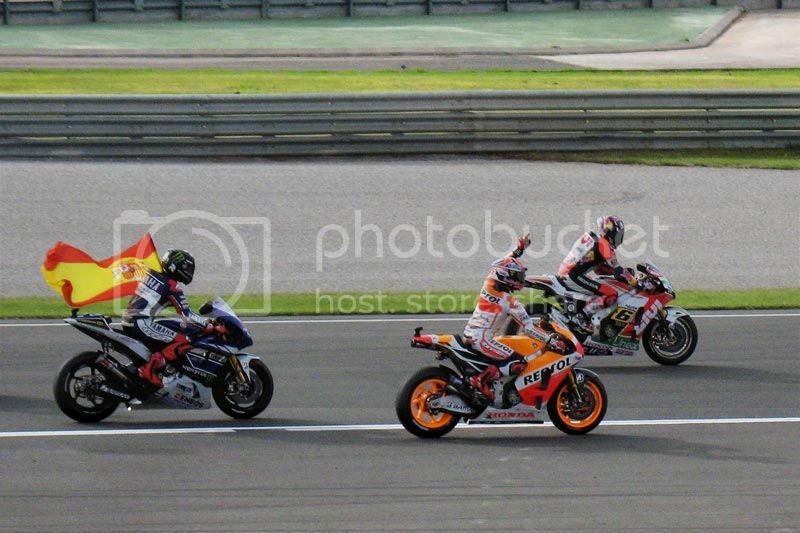 The Moto3 race was particularly competitive. 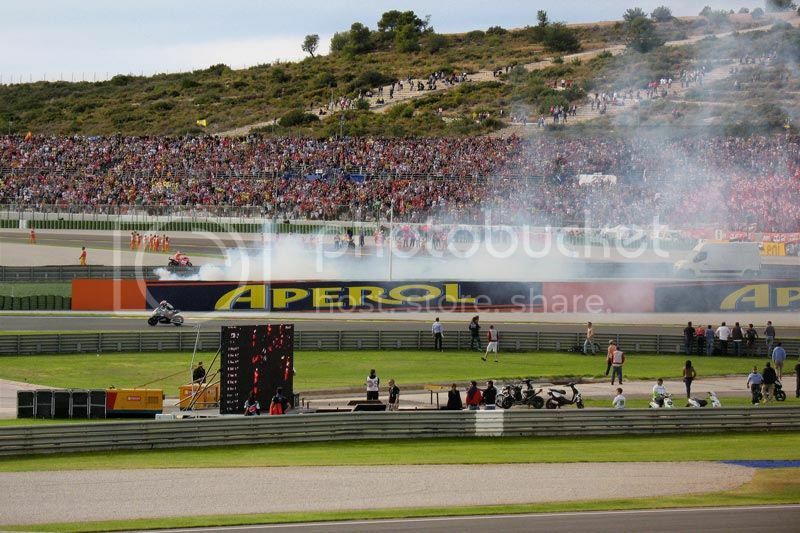 Moto2 was very good even if it was a bit of a formality. 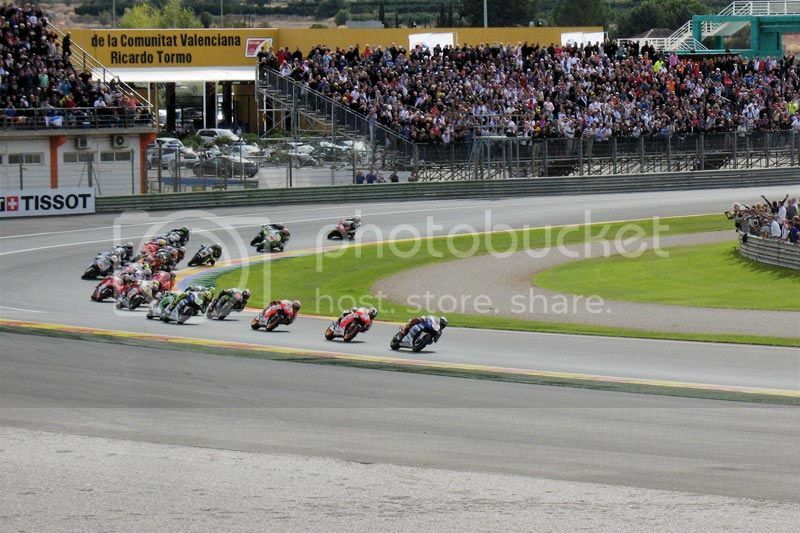 The GP bikes and riders stole the show in the end and I was nothing short of impressed with the whole thing. There's no point for me to try and commentate on the racing as I'm no expert and everyone has seen it on TV anyway. All I can do is offer this small selection of images as a reflection of the day. If we had a wide angle lens with us, there's more! Bikes as far as the eye could see. 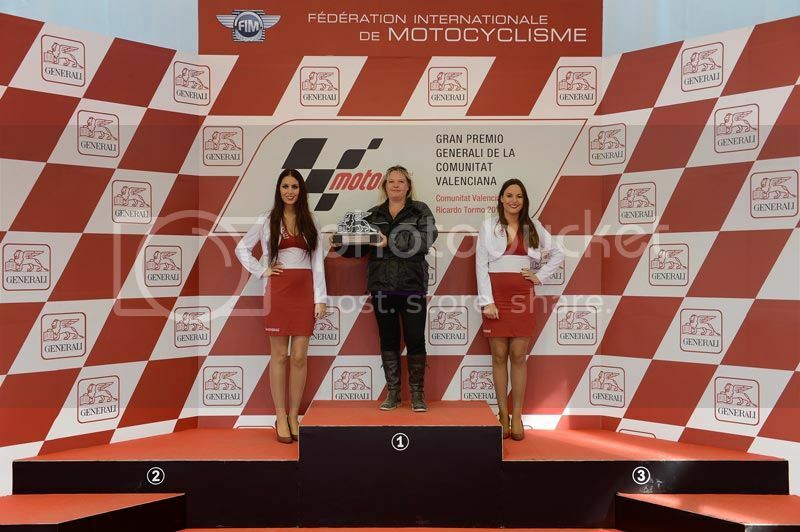 The wife had already won before the bikes had even started.